Most people I know, claim it was a Good Thing™ slavery was abolished, but believe it or not, some people secretly keep slaves, not here in Canada mind you. Their slaves live in Africa and South America. They hire people to oversee the slaves. Unlike slaves of old, these slaves don’t even get enough to eat. a pound — a price lower than it was even in the depression days of the 1930s. Coffee-drinking you are an unwitting slave owner. If you are willing to do that, all you have to do is buy coffee marked as Fair Trade. Ask for it at restaurants and grocery stores. There are many different brands to choose from. If you ask me, people who knowingly keep slaves to save $0.02 a cup on coffee are sick. It’s easy. Just say, I’d like a cup of Fair Trade coffee please. Even fair traded is not all that fair. 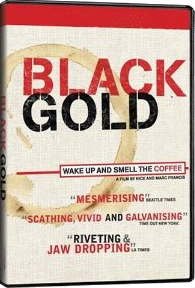 It primarily kicks in when the international price of coffee drops below $1.20 US a pound to put a floor under the prices. However, coffee can still sell at $30.00 US a pound to consumers. Graph of Fair trade prices. It is fairly easy to get a company or government office to switch. It does not cost much and is good for public relations. a cup extra for Fair Trade coffee makes a tremendous difference to the grower. Grow the coffee trees. It takes 15 of them to keep one person in coffee. Immediately remove the outside fruit pulp. The pit is the coffee bean. Dry the coffee beans in the sun. Ship the beans to a coffee exporter. This ends the work done by the coffee farmer. Sort the beans individually by quality. One bad bean in a bag will ruin it. Sometimes this work is done by the farmer. Ship the beans to a roaster. Sometimes the green beans are sold to the consumer without first being roasted. Bag the beans for sale, or grind them then bag them. The consumer grinds the beans. The consumer pours boiling water over the grounds and lets them steep. The consumer separate the grounds from the hot coffee with some sort of filter. Serve, optionally with cream and sugar. in the west. In the days of slavery, a slaveowner had to provide sufficient food and lodging to keep his slaves alive and sufficiently healthy to work. Today he does not. The coffee farmers in Ethiopia (where the finest quality coffee comes from) routinely die of starvation. to grow. These dirt poor farmers had to lose money, hoping for better times, or give up entirely. Nestlé has unfair advantage of the poorest of the poor. They have no conscience. They don’t deserve to stay in business. Please do not buy your coffee from them, not even instant coffee powder. It is more than just coffee where the Africans fail to get a fair shake. We in the west have really screwed over the Africans so they get poorer and poorer every year. For example, in North America and Europe, we subsidize our farmers to make it difficult for African exporters of agricultural goods to compete. However, using the leverage of the IMF (International Monetary Fund), we have forced all African nations to drop similar agricultural subsidies. That makes it easy for America and European exporters of grain to undercut native African farmers. You think we would cut the Africans a break. Instead we take advantage of them my enforcing a tilted playing field. Also look for shade-grown coffee. The rainforest canopy is not destroyed which supports the birds and animals. Mass production coffee farms remove the rainforest cover purely for convenience. We buy Creekmore coffee at the local supermarket. It is roasted here on Vancouver Island in Qualicum Beach. Another great local brand is Salt Spring made on nearby Salt spring Island. You can get Clipper fair trade, organic instant coffee. The coffee is grown in Papua New Guinea and is packed in Germany. This is the best instant coffee I have ever tasted. It hits you with a delicious coffee aroma just opening the jar — expensive but fun. Even Starbucks now offers one fair trade blend they call Café Estima. To their credit, it is one of their least expensive offerings. To find out where to get it from a source near you try searching for fair trade coffee. Since I wrote this essay, Fair Trade coffee has become ubiquitous, at least here in Victoria. Grocery stores carry many brands and every public and government event serves only fair trade coffee. There are dozens of excellent brands to choose from. The international fair trade certifying organisation is called Fairtrade International. They maintain lists of certified coffee roasting companies. They audit to make sure the coffee truly is fair trade. They also provide similar certification for fair trade chocolate, tea, sugar, tropical fruits, and soccer balls. There is some phony fair trade stuff out there. If you don’t see either of these two certification logos, be suspicious. Most of the world’s fair trade certification groups are in the process of converting to the international logo. 710 mls 1½ US pints venti applies to cold drinks. 592 mls 1¼ US pints venti applies to hot drinks. Italian for twenty. 473 mls 2 US cups grande pronounced grawnday, Italian for big. 355 mls 1½ US cups tall What you get if you ask for a small or regular. 237 mls 8.01 fl oz short To get it you must ask for short, not small. You don’t know how big you cup is? Fill it with water and pour it into a kitchen measuring cup. A cup of coffee is 177 mls (¾ US cup). A serving of cream is 20 mls (1.35 US tablespoons). It takes 7 grams (108.03 gr) of ground coffee beans to make one cup of coffee. for each serving of sugar. Compare that with a cup of Starbucks or a cup an a restaurant. Most often there is no additional cost for Fair Trade, but even when there is, it amounts to only a few pennies a cup. When people complain the tiny premium for fair trade, but have no problem with Starbucks prices, it means there is something other than the money at play. A decade ago, fair trade coffee was hard to find, but where I live now, nearly all coffee is fair trade, at least the beans roasted locally. It an embarrassment of riches. There all kinds of specialty coffees. I have tried Kicking Horse Coffee, Salt Spring Coffee and Van Houtte. They are all excellent. Level Ground is delicious but the fair trade credentials are not as clear. My roommate and I consider the Ethiopian Harrar, with notes of Cherry, Tamarind and Cocoa as the best coffee ever. The Solstice Café ; introduced us to it. You can get it from the Fernwood Coffee Company. McDonalds makes the best coffee for a fast food outlet, but it is not fair trade. I don’t like dark French roasts. I would not start with them if you are just beginning to try something new. Snobs eschew Robusta beans, mainly because they are less expensive. They have that pleasant breakfast coffee smell. Just because a coffee is organic does not mean is Fair Trade and vice versa, so check the labels. You can sometimes be seduced by all the earthy imagery in the ads into presuming both. When I was a teen I became a coffee snob much like a wine snob, showing off by telling people what their blends were composed of and hosting a coffee tasting party where I served rare coffees from all over the world. I was popular in student residence because I had mastered the art of making the perfect cup of coffee. The odour would attract people who appeared at my door on all manner of pretexts. If you buy tea you probably should not drink anything but organic. They spray the leaves with insecticide daily and you consume the leaves. With coffee it is not so important because the coffee bean is inside a sweet cherry-like fruit, which is discarded. However, you don’t want to poison the nice people who grow your coffee. In the olden days, coffee always came in 453.59 grams (1 lb) bags. Now it comes is many sizes. When you buy coffee beans, compute the cost per gram, not the cost per bag. Many websites do not tell you how much their bags contain. You have to ask. This is a dishonest business practice, but unfortunately widespread. You will notice a predominance of BC and Canadian suppliers below. There are two reasons for this. I am more familiar with local businesses. Fair trade took off in BC long before the rest of the world. BC vendors have a head start. A number of suppliers offer a coffee-of-the-month subscription. If you don’t know what you like yet, this is a fun way to find out. Happily, this list as growing so fast and so long it will soon be obsolete. It will be like telling you where you can get baked beans. 49th Parallel Roasters Burnaby BC not fair trade. Aroma Coffees Quadra Island BC Wholesale only or drop in. Arco Superior WI Fair trade organic and ordinary. Jamaican blue mountain, Hawaiian Kona, green beans, small sample bags. Bean North Yukon YT Fair trade and organic. Birds and Beans Etobicoke ON Fair trade, shade grown. Canterbury reSIProcate Richmond BC Fair trade and organic. Dean’s Beans Orange MA Fair trade, organic. Doi Chaang Vancouver BC coffee from Thailand. Have a program called Beyond Fair Trade. Earth’s Choice Vancouver BC Fair trade organic. Head office is in Vancouver. Beans are roasted in Toronto. for a 340 grams (11.99 oz) bag. Fernwood Coffee Victoria BC Sell Ethiopian Harrar, the best coffee I have ever tasted. The packaging is quite classy, nice for gifts. It costs them so much they give you a discount if you refill your old bag. Fire Roasted Coffee London ON Fair trade organic and ordinary. Just Us Coffee Grand Pré NS Co-operative founded in 1995 selling fair trade. Kicking Horse Coffee Invermere BC All coffees are Certified Organic, Fair Trade, Shade Grown, Arabica beans roasted in Canada. This one of the more popular retail brands where I live. You can buy online, though the button to do so is not prominent, off to the far right after you hit ordering info in the fine print. It’s as though they don’t really want you ordering online. Level Ground Victoria BC They have a fair trade scheme, but not a certified one. This lets them offer lower prices. My roommate particularly likes their low acid Bolivian. It a mild aromatic coffee. Marley Coffee Kingston Jamaica Bob Marley, Jamaican theme, including, of course, Jamaican blue mountain and Ethiopian coffees. Organic Fair Cobble Hill BC Fair trade chocolate (excellent), coffee, spices. Make chocolate bars direct from beans. Pacific Coffee Roasters Vancouver BC Fair trade organic. for a 340.19 grams (12 oz) bag. Reunion Island Oakville ON Fair trade organic and ordinary coffee. Salt Spring Coffee Salt Spring Island BC certified organic and fair trade. Popular retail brand in Victoria BC where I live. Have a sampling subscription program. Strictly Organic Bend OR Fair trade organic. It is primarily a café with only a limited number of coffee offerings. Transcend Coffee Edmonton AB They pay more than Fair Trade prices, but this is not certified. Van Houtte Montréal QC Fair trade organic. Given how easy it is to make excellent coffee, it is a wonder people put up with so much awful brew. Here’s how to do it. 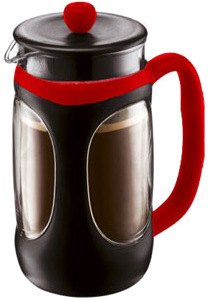 Paper filter coffee (Melitta style) makes the best tasting coffee, though other techniques such as percolating create better room aroma. Percolators fill the air with wonderful coffee smell, but leave little flavour in the coffee and tend to be bitter. A Bodum (aka French Press) tends to create a cloudy rich peasant coffee. The instructions that come with a Bodom tell you to stir in with a long thin plastic spoon, not metal, to avoid scratching the glass. I have scoured stores. I could not find one. Instead I used a wooden chopstick, then replaced it with a thin Trudeau seamless silicone spatula. Add a pinch of salt to the dry coffee grounds. The trick is to make concentrated coffee then water it down, rather than filtering all the water through the coffee grinds. This avoids leaching out the bitterer components of the coffee. Of course, you must grind the beans freshly. The odour of the beans is far more intoxicating than the final beverage. I find the milder, cheaper beans such as Mocha Java, Brazilian, Guatemalan, Kenyan and Kona make a mellower coffee. Add a little Dark French if you want to give it a Starbucks bite. To make the perfect cup of coffee, make sure you wipe out the grinder with a Kleenex after use so you will have no coffee grounds going stale to spoil the next batch. Adding a subliminal pinch of cinnamon, nutmeg, clove or ginger or a drop of organic vanilla or orange juice can add a little interest. Be subtle. People should just barely be able to tell the coffee is different, not how. Wipe a touch of orange essence around the rim of the cup and watch eyes pop with delight. Of course, you want to use fair trade coffee, both because you get the higher quality beans that way and to play fair with the people who grow the beans for you. 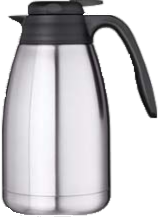 If you don’t serve the coffee right away, put it in a Thermos carafe. If you leave the coffee exposed to the air it will rapidly oxidise and get that all-night diner taste. It will keep a remarkably long time in a sealed Thermos. Coffee makers with warming trays under a glass pot turn out horrible coffee by oxidising it. When I was young, my rebellion into the drug world consisted of learning to recognise the various types of coffee, much like a wine connoisseur. I would buy 100 grams of beans at a time to try out all the possibilities. I hid coffee making equipment in the back of my closet. I did manage to pull off a Wire Paladin/James Bond thing a few times, surprising people by telling them what was in their personal blend. Age has taken away my unusually keen sense of smell, so I doubt I could do it now. Direct Trade gives the grower 20% above that. Fair-trade shade-grown coffee is very popular in Victoria where I live. Coffee is big business. It is the leading crop traded on the international market. It is the most valuable international commodity next to oil. To find out where to get it from a source near you try searching for fair trade coffee. To find out where to get it from a source near you try searching for fair trade coffee. The international fair trade certifying organisation is called FLO. They maintain lists of certified coffee roasting companies. They audit to make sure the coffee truly is fair trade. They also provide similar certification for fair trade chocolate, tea, sugar, tropical fruits and soccer balls. There is some phony fair trade stuff out there. If you don’t see either of these two certification logos, be suspicious. Most of the world’s fair trade certification groups are in the process of converting to the international logo.